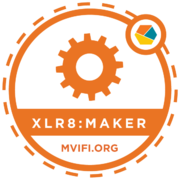 Individuals who earn this badge have indulged their own curiosities by exploring part of the MVPS Maker ethos during one of the dine and design learning sessions (or comparable). Earners of the badge (1) made something - which may or may not have worked as intended; (2) contributed to the creation-based spirit of the evening; (3) engaged in the event's reflective dialogue with their colleagues; and (4) uploaded evidence of applied learning (eg. tweets, blogs, Instagrams, Storify, etc), to be validated by MVIFI’s nucleus team.